Today I am having second thoughts about remodeling the basement by adding a bedroom! I have spent the entire day today and yesterday trying to get all the drywall mudded. My feet hurt. I thought having a timeline would be good because we tend to drag on remodels to ridiculous levels (aka, the master bathroom remodel that is going on 8 years now). But after spending every waking hour this week working hard, I just want to curl up with my glue gun and do something that is not remodeling! 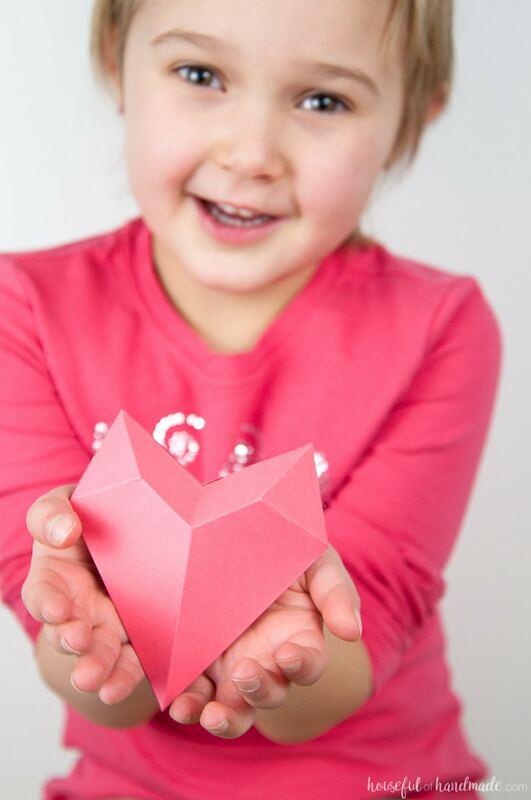 So today I am sharing a fun and easy 3D heart Valentine with you. Valentine’s Day is pretty chill at our house. My husband refuses to fall into the commercialization of the holiday (his words, not mine). So instead of buying gifts for each other, we have a fun family day and we give the kids fun little gifts. 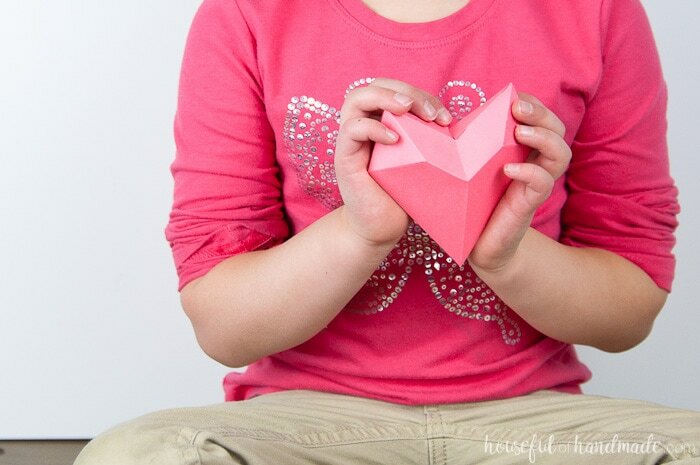 Last year they each got a new shoes for spring, this year I made these cute little 3D heart valentines to fill with some little goodies. 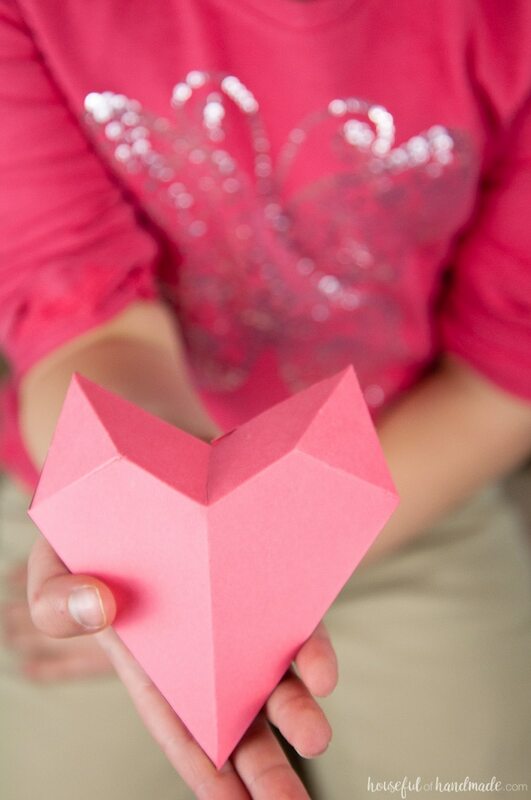 I also want to make a bunch of these 3D paper hearts for some simple Valentine’s Day decorations. How cute would these be made out of metallic cardstock and strung on a string across the mantle? Or make a bunch to fill a bowl on the coffee table. I just haven’t had a chance to make lots more in and around the drywall and remodeling. But things have to be ready for paint by the end of the week so hopefully next week I will have a whole lot more time to create. 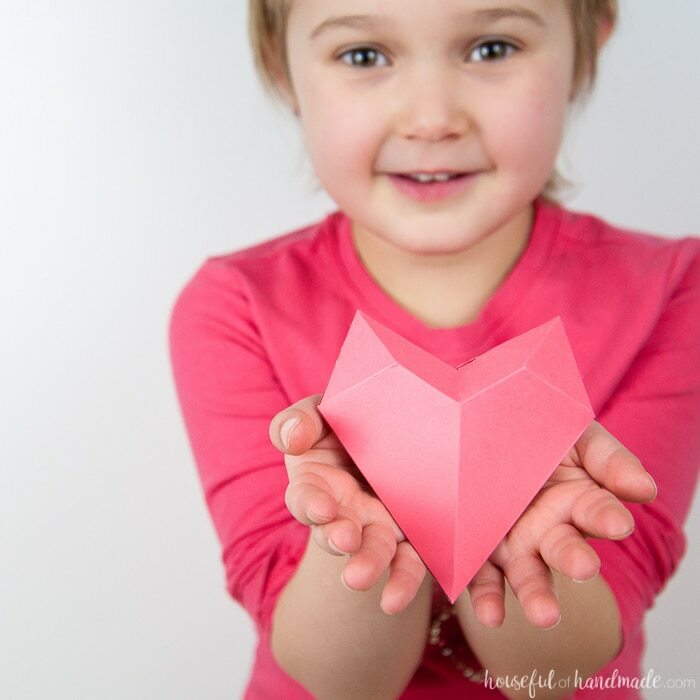 If you have a bit more time than me, you can get the free printable pattern and learn how to fold up these easy 3D hearts over at Oh My! Creative. Click here for the tutorial. And now I am going to go to sleep so I can get up and remodel a bit more tomorrow. I keep telling myself it will be worth it, I really hope it is! These are so cute and would be so fun to fill with small treats. Thanks for sharing this on Merry Monday. Thanks Erlene! They are perfect for filling with little treats.